Each of your current assets fall into one of these four phases, and all future assets will follow this same process, as well. The first step in the asset lifecycle might be considered the most exciting. This is the time when videos are shot, photos are taken, and designers flex their creative muscles. This phase includes brainstorming, planning, execution, and approval of your asset needs for upcoming projects and campaigns. Tip: To get the most out of your assets in this phase of the lifecycle, make sure you’re utilizing insights from previous campaigns. Understanding how similar assets were used and engaged with in the past can help determine what to invest in next. Use data and analytics from your marketing technology tools to optimize your new content for success. Your team created some fantastic new assets — now what? During the management stage of the digital asset lifecycle, you’ll focus on the administration of your new assets. You need to have each asset approved by the right individuals, ensure the right teams have access to the necessary assets, and handle any other logistics around organizing them. Then you have to keep each asset up-to-date for future use. Tip: Leveraging tools to streamline the approval process ensures feedback and revisions are easy to track. Once approvals are in hand, adding your asset to a secure, searchable, centralized location gives your teams a consistent access point for updates and use, while controlling who has access to each asset. When executed correctly, digital asset lifecycle management extends an asset’s lifetime by making it readily available for future relevant projects. This phase is the one that teams often focus on the most because you’re sharing all of your hard work with the world. Whether that means sending files to affiliates to use or publishing them on social media or your blog, all of your assets will likely be distributed at some point. And distribution relies on providing quick and easy access to relevant assets. Although marketing channels are numerous, almost all involve a digital element. So it's important to distribute your assets in an easy, secure, and trackable manner. Tip: Emailing files back and forth is cumbersome and hard to manage. And because large creative files often can’t be sent via email, relying on this method of distribution and collaboration won’t scale. Uploading files for a single use in a blog, website, or marketing email works, but you can lose the ability to track asset interactions. Using portals, embed codes, and share links to distribute your assets not only makes assets easier to use and receive, it captures asset interactions including views and downloads, too. Knowing how and where your assets are being used is a great way to inform future content creation and distribution. Many teams forget about this step in the digital asset lifecycle altogether. Preserving or archiving assets is actually an essential part of an asset’s life. Once it isn’t needed for distribution in the foreseeable future, you can choose to preserve it for historical or future use. Archival, or cold storage, preserves inactive assets at a cost that is often lower than active storage. Moving files to an archive also keeps your asset repository clutter free, helps ensure that only currents assets are used, and keeps inactive assets safe until they’re needed. Tip: Which assets should be archived? That’s a million dollar question. The answer often depends on your brand standards, your company’s policies, and your personal preferences. Old logos show the historical evolution of your brand, but you might not need to save every file format. Campaign elements are helpful to refer back to when trying to remember what you did last year. And key documents provide access to past policies, details, and communications. But not everything added to the archive needs to be old. Archiving large files used in a new asset — like raw video footage or unused photos from a recent photoshoot — can save space, money, and time. Just like plants and animals, digital assets go through a lifecycle. If you’re not careful, you can lose track of where your assets are in their respective cycles, leading to digital asset overload. Creating the right process and using the right tools keeps your assets in check and ensures that they’ll always live their best life. Looking for the right tools to help with your digital asset lifecycle management? 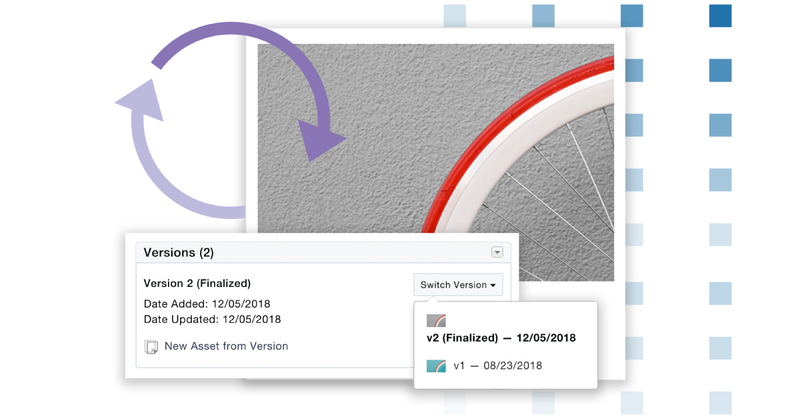 Learn how a digital asset management (DAM) solution can help you effectively scale and maintain each phase of your asset’s life.